There are things about owning a home that can be frustrating. One of those things is dealing with rotten exterior wood trim. There are several things one can do to help prevent exterior wood trim from rotting. Most of these tricks are to be done during the installation process. Some are a matter of upkeep, such as filling cracks and repainting as needed. But let’s be realistic, we are talking about wood that is exposed to the elements. It will rot. It is just a matter of time. When it does rot, it needs to be replaced. There are many how to videos out there showing how to replace roof trim boards such as fascia boards and rake boards. You can watch them and give it a try. Or you can hire us. Either way, that rotten wood you have needs to be replaced. It is not just a matter of making your house look good. It is a matter of making your house last. You may be thinking, “It is just a piece of exterior trim. How can that affect the longevity of my house?” Thank you for asking. Though you may not realize it; your fascia boards, in particular, offer a great deal of protection for you house. They are part of your homes first line of defense against the elements. Your shingles, siding, windows, doors, and exterior trim boards protect you and the structure of you home. If your fascia boards rot and are not taken care of, water will get in your home. You will not se e the internal damages at first. The next part of you home to rot is your trusses and roof plywood. It will start with the ends and work its way back to the rest of the board. When enough of the truss rots away, the load capacity of the roof is greatly reduced. This will allow for the roof to sag, the ceiling to sag, and open more channels for water to get in. Your gutters are not nailed into just the fascia boards. Instead they are nailed into the ends of the trusses. Gutters begin to pull away from the roof when this wood is rotten. Now with the fascia board being rotten, the ends of the trusses being rotten, the gutters pulling away, and the roof sagging; water will find any way down that is possible, even through your walls and down to you floor boards. 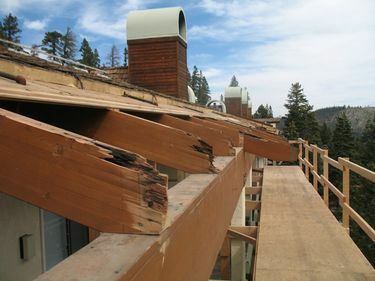 The most common damage I have seen personally when fascia is left to rot is the tails of the trusses beginning to rot to the point they no longer hold nails for the fascia boards or gutter spikes. Take a walk around your house and make not of any spots that need to be looked at. Contact us and we will be happy to come out and take a look.